Panel Discussion/ Q and A with Former GI residents, Service Members and Coast Guard “brats” MC’d by Kevin Fitzpatrick: Hear what life was like when Governors Island was an Army and Coast Guard base. Our special guests will be the former residents who used to call the buildings around us their home. Book Signing w/ Author: Kevin Fitzpatrick: Governors Island Explorer’s Guide, Published 2016. Free history walking tours led by Kevin C. Fitzpatrick, a sightseeing guide and author of The Governors Island Explorer’s Guide (Globe Pequot). Storytelling: Former Residents share stories of their time living on the island. The stories will be recorded for posterity, and shared online and sent to the U.S. Library of Congress. 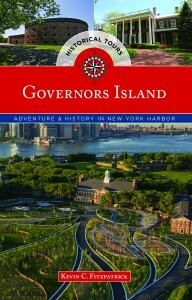 12:30- 2:00 Book Signing – Meet Kevin C. Fitzpatrick, author of The Governors Island Explorer’s Guide. 2:00 Free Walking Tour – Take a 45-minute walk around Nolan Park and learn the history of the park and Governors Island. 3:00-3:45 Panel Discussion/ Q & A – Meet former residents of Governors Island and hear their stories about island life when it was a military base. On the Brooklyn ARTery Soundstage next to Building 10B. 4:00- 5:00 Storytelling – Former residents will individually tell their stories on Brooklyn ARTery porch. 5:00 -5:30 Book Signing – Meet Kevin C. Fitzpatrick, author of The Governors Island Explorer’s Guide. If you are a former Governors Island resident and would like to be a storyteller and participate in the event, please contact Kevin Fitzpatrick.